On our recent holiday in Bali we ate some beautiful breakfasts! Linking up with Wordless Wednesday, hosted by My Little Drummer Boys. Trish has posted amazing photos of gigantic trees, check them out! The doughnuts in the pix weren’t my breakfast by the way! What’s your favourite holiday breakfast? Oh dear, my three boys ate the most shocking breakfasts when we were there, lots of bacon and doughnuts but at least they got a lot of fruit in too. Sigh! Aren’t Bali breakfasts the best ??! Gorgeous colours. Love the lime in the fruit salad – gorgeous and personal touch ! I took the photos of the fruit and thought I’d try to replicate it when I got home… complete with lime… but haven’t of course, just chop fruit in my usual much more basic manner. One day…. 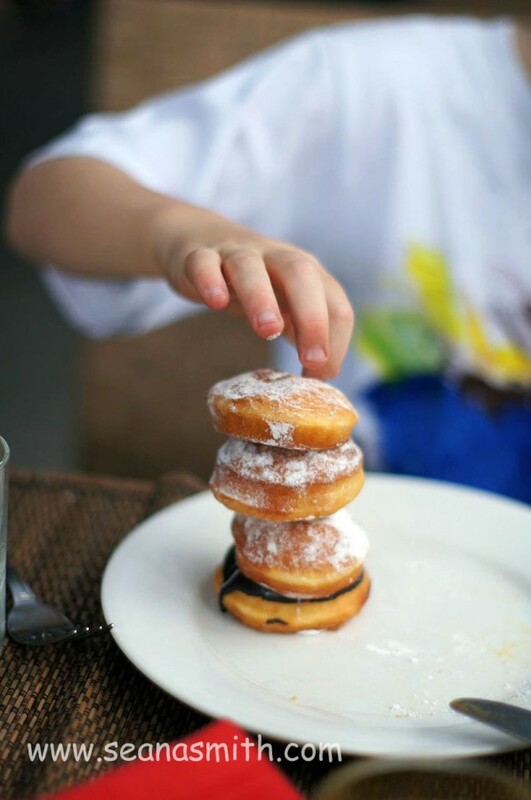 mmmm now I am starving for doughnuts and fruit & eggs – I must go to Bali one day. My biggest son found black pudding at a butcher’s at the local market and he loves it. Hmmm… not sure myself, I worry that I’d have an instant coronary. Have you ever tried square sausage? Or Xmas pudding fried in butter. Those low-cal Scottish faces… NOT found in Bali! Me too, and we’re having lots of mango smoothies for brekkie now as they’ve suddenly arrived in volume and quite cheap. But the eggs and mushrooms were my brekkie, had fruit too. Not very pretty, but yummy and healthy. Buffet breakfasts are one of my very favourite things!! Ooh yum! I looooove breakfast. My favourite meal of the day! I went to Adelaide this week and had some delish poached egg, spinach and smoked salmon on thick crusty toast. Too good! The great thing about breakfast is that I’m usually hungry, and I know it’s good to eat a solid brekkie… so I can really enjoy it. Am definitely moving away from large meals in the evenings and eating more in the day when my poor old body is most active. That looks SO yummy! I love breakfast, but reading your post, I realised that the first time I fell in love with the concept of breakfast was when I went to Bali when I was 14 (about 18 years ago!). A family friend had suggested to my mum to get a package that included breakfast, and WOW! The hotel breakfast was just sensational. I remember the choices including blueberry pancakes, fried rice, miso soup, eggs any way you liked them and nearly everything you could imagine. Such a frugal thing to do, as it meant we barely needed to eat the rest of the day! Yes, we ate huge breakfasts and then nothing until mid-arvo, well the kids did have snacks. Very economical in its way. I love a big breakfast, have been trying to eat more and smaller meals recently but miss a huge brekkie… must have one soon. Take me, take me! I’d love to go again! see, I would have gone for all the unhealthy stuff in that selection 🙂 love big buffet breakfasts on holidays!! p.s. has your blog had a make over? Or am I dreaming? Hi Cathy, yes I’ve made a few changes, mainly making it have three columns, so it’s all a but wider. Am always a fiddler! Yum, yum, yum to all of it, especially the fruit. I LOVE my papaya and eat lots of it when I visit South East Asia.